Injuries to the cuff produce pain with overhead activities or reaching back, as if to put on a coat. The rotator cuff muscles and tendons may be injured by trauma, such as falling when skiing or biking, or from arthritic spurs that form within the shoulder and erode the cuff tissue over time. You may experience weakness of your shoulder or night pain when rolling onto your shoulder while sleeping. Inflammation of the bursa or a tendinopathy of the cuff can be successfully treated with physical therapy, growth factor injections, or anti-inflammatory drugs. Complete tears are usually best treated with surgical repair. "A careful physical exam helps clarify the cause of shoulder pain. An MRI is usually definitive about a rotator cuff tear versus an impingement from a bone spur. Our surgical techniques are outpatient anatomic repairs, and our patients are usually able to resume all of their former sports activities after completing proper physical therapy." Shoulder impingement is also known as rotator cuff tendinopathy, swimmer's shoulder, or thrower's shoulder. This injury occurs when the tendons of the rotator cuff muscles become irritated and inflamed, which may lead to weakness, pain, and decreased movement in the shoulder. These symptoms lead to a continuing cascade of dysfunction, including continued spreading inflammation to the other structures of the shoulder such as the bursa. Traditionally, cortisone injections are used to decrease inflammation. Now, however, growth factors and lubrication are showing promise as alternative methods to stimulate repair of the inflamed tissue. If impingement fails to respond to conservative care, which includes physical therapy to address the mechanical deficits leading to the impingement, it can be treated with arthroscopic debridement of the impinged tissue to create more space in the shoulder for proper rotator cuff function. The treatment of the inflamed tissue in tendonopathy or impingement is usually non-operative with physical therapy, medications, and sometimes injections. If that fails, surgical resection of the bursa and other inflamed, scarred tissue can be performed at an outpatient surgery center under a local anesthetic. 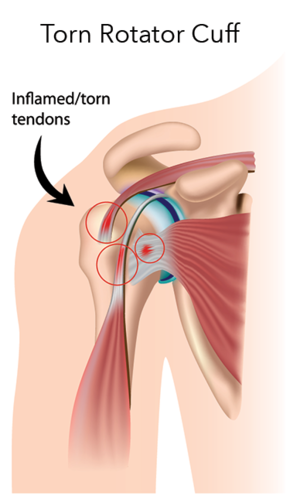 The thickened and inflamed tissue is removed to permit the rotator cuff tendons to have normal, unrestricted motion. Rehabilitation is relatively rapid after a bursectomy or debridement. Activities are progressively regained over the course of a few weeks. Rotator cuff tears can be partial or complete. Partial tears can sometimes heal with the assistance of physical therapy and platelet-rich plasma (PRP) injections. Complete rotator cuff tears rarely heal. Usually when there is pain or weakness, it is our preference to repair the torn tissue rather than permit the damage to progress to irreversible atrophy. Surgical repair is performed at our outpatient surgery center under a local regional block anesthesia. The rotator cuff is viewed and repaired arthroscopically. Sutures and suture anchors are placed into the bone to allow the rotator cuff to be positioned back into its normal insertion sites. 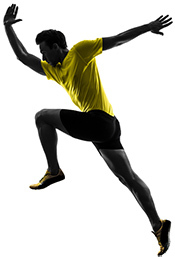 Anatomic, strong repair is the key to rapid and complete rehabilitation. We perform shoulder surgery in the beach chair position, with the patient sitting up, and under a regional anesthetic (interscalene block). The shoulder is examined manually and the inside of the shoulder is viewed with the arthroscope. 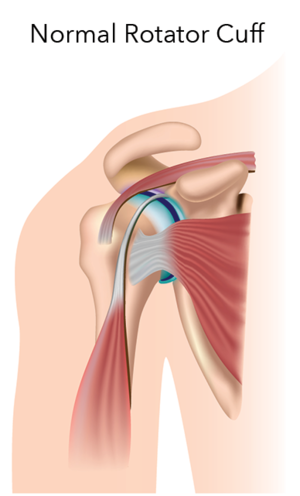 All the structures of the shoulder are examined and treated as necessary. If the rotator cuff tendons are torn, the edges are identified and sutures are passed into the tissues. The anatomic insertions of the rotator cuff tendons are prepared with an awl to create a bleeding bed. The rotator cuff tendon is pulled over this bed and anchored into the bone with suture anchors. The shoulder is taken through a full range of motion to confirm the restoration of normal anatomy. Physical therapy begins the following day, working within the range of motion found to be safe at the time of surgery. Our experienced rehabilitation team implements a program that protects the rotator cuff during the healing period but permits a range of motion and strengthening exercises.